BOGOTÁ - 27 SEPTEMBER 2018 - The Colombian energy sector is increasingly turning to solar and renewables in order to diversify its electricity mix, which has been mainly dependent on hydropower. 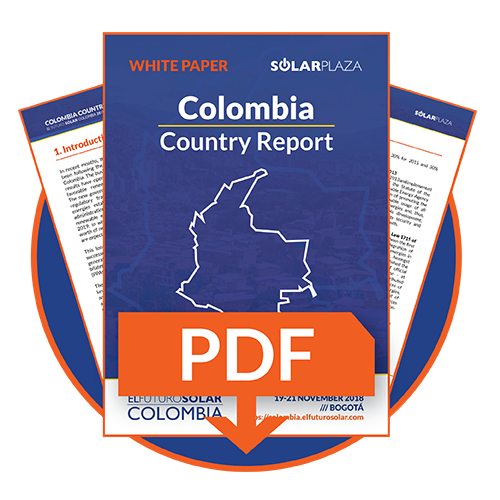 Solarplaza’s “Country Report Colombia” outlines the current state of the Colombian solar market and its immediate prospects. As of September 2018, the total installed energy capacity of the Colombian National Interconnected System (SIN) amounted to 16,918.33 MW, with almost stemming 70% from small and large-scale hydroelectric plants. Compared to other countries in the region, such as Chile or Brazil, Colombia has not yet rushed to adopt other non-hydro sources of renewable generation. Consequently, this source of electricity generation (hydropower) continues to dominate the Colombian energy sector. When looking at the installation and generation costs for renewables in Colombia, it can be concluded that hydro energy has the highest costs of the considered renewable energy sources. Solar energy, on the other hand, was found to be the cheapest source when it comes to both installation and generation expenses. It shows that this renewable energy source is the most cost-efficient in Colombia. The country’s energy sector has received much attention since the government announced it will organize its first large-scale renewable energy auction in January 2019. The Colombian Ministry of Mines and Energy is looking to allocate around 1.5 gigawatts (GW) of capacity to different types of renewable energy sources. The auction will offer 10-year PPAs and has a COD deadline for December 2022. At the moment, Colombia only has an estimated 20MW of distributed solar PV capacity, to be complemented by Celsia’s Solar Yumbo plant, with a net installed capacity of 9.8 MW, which began operating on September 3, 2018. In addition to Celsia’s Solar Yumbo, the company is working on the construction of three other projects, which could be connected to the grid in 2019. Enel has also already been active in the Colombian solar market and will build the country’s largest solar project, the 86.2 MW El Paso solar power plant. The plant is scheduled to start operations before the end of 2018. If all of these projects get commissioned in time, it will mean a significant increase of Colombia’s solar energy capacity. Until 2016, most of the electricity generation projects in the country were hydroelectric. Recent changes, however, have caused the number of registered solar projects to significantly grow from 268 in August 2017, to 387 as of August 2018. It is expected that by the end of 2018, the number of registered solar projects could reach double the capacity that was registered in 2017. It still needs to be seen how the Colombian solar energy market will take up the energy auction planned for 2019. Nevertheless, there have been numerous signals that show the country is committed to fulfilling its sustainable development targets, which could guarantee the country’s energy sustainability in the short and long term.